Get some answers to frequently asked questions about cacti, succulents and our club. If any questions are left unanswered, please send us an email by going to our contact page here. The monthly meetings usually take place at the Phinney Neighborhood Community Center beginning at 2pm and ending at 4:30pm. Set up starts at 1:30 p.m. and tear down happens after the meeting. You are welcome to come in early and stay late to lend a hand. Check the calendars on the program page, address and map information will be available to you. For more information on our location, please visit The Phinney Center website. Our club is a chapter of the Cactus and Succulent Society of America. You can find more information on the national organization by clicking here. Go to our contact page, scroll halfway down, and fill out the form. It’s that easy! Please bring your membership fee to the first meeting you attend or mail it to Membership, PO Box 55593, Shoreline, WA 98155. Note: We are transitioning to an October membership renewal month, so the current membership fee is $2/month. For example, if you join in March your fee would be $14. What’s the difference between a cactus and a succulent? First of all, succulents are plants which store water in the plants, stems, and leaves. Some examples would be aloe, sempervivum, and sedum. This is also true of cacti. 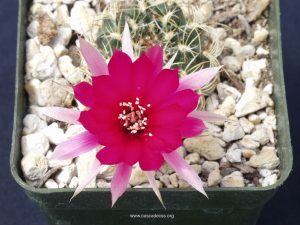 What sets cacti apart from other succulents is the presence of areoles which are small mounds from which spines, leaves, hair, and flowers grow. Cacti is a sub group of succulent plants. Not all succulents are cacti, but all cacti are succulents. Where can I buy cacti and succulents? Our club’s annual sale is the second weekend in August at Sky Nursery in Shoreline, WA. With a minimum of 10 vendors you can find plants for dish gardens, bonsai, a variety of succulents and cactus and some hard to find varieties. Also, you can head to the Cactus Mall by clicking here. There is also a lot of great growing and care information here. Succulents are very popular now, so many varieties can be found at your local stores and nurseries. We are beginning to find interesting varieties of cacti in local stores now as well. There are many mail order vendors we turn to. Another consideration is to grow from seed which can be purchased through mail order from vendors and the Cactus and Succulent Society of America. What kind of soil should I use for my cactus/succulent? Cacti and succulents should be planted in gritty, well-draining soil. Some cacti appreciate rockier soil than others, it really depends oon the plant and your climate. The bottom line is your soil should be very well-draining and not retain moisture or the roots on your plant can rot. When you water your plant, you should see the water come out of the bottom of the pot immediately. One mix that is popular in the Northwest US area, where we have a lot of dampness, follows: 50% potting soil to 50% pumice/perlite. Pumice works best because it doesn’t float and end up as top dressing. Some of us go to 60% pumice to make an even lighter mix. And plants vary in what they need, so you might need to alter the mix for specific plants. How do I get my Christmas Cactus to bloom? Some people believe they bloom best when pot bound. That might be true since they don’t need to be re-potted very often. Darkness and cool weather seem to help. Some of us have success by putting them outdoors under a bush that allows for partial sunlight during summer. Leaving them outdoors later into the fall, as temperatures drop into the 40’s seems to work also. Why do my Jade trees die? There might be several reasons for this. Remember that Jade trees (Crassula ovata) are succulent plants, already full of water. Even though the soil might be dry, the plant is still full of water. Consequently, watering is often the issue with jade trees. Planting them in well draining soil, (see above) and watering them infrequently can help. Limiting watering to when the leaves begin to soften is one strategy for longevity. In our area, Jade trees enjoy a vacation outside during the summer. If moved out into the sun gradually, they can take quite a bit of it. Succulent plants will sunburn just like us, if moved into full sun too quickly. One of our members allows his Jade trees to go dry all winter and when they become floppy, he ties the branches into knots! How do I get my cactus to bloom? Blooming takes a lot of energy and cactus get that from the sun or from lights. If a cactus isn’t getting adequate light, it won’t bloom. Also cactus benefit from a winter rest in order to bloom in spring or summer. Depending on the cactus, it might enjoy a cool rest with temperatures at 40-45 degrees F. Often plants grown indoors, under fluorescent supplemental light still will not bloom. But those which have overwintered in a greenhouse or other outdoor housing will bloom due to a cool, dry winter rest. 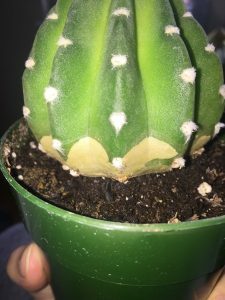 Why does my cactus/succulent look weird? This cactus is “etiolated”. Etiolation is what happens when a cactus or succulent does not have enough light in its current place and goes through an unhealthy growth spurt to seek out the light. Often round cactus begin to look like a “conehead”. 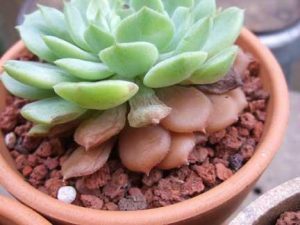 If your cactus or succulent is etiolated, there are some strategies to address this. 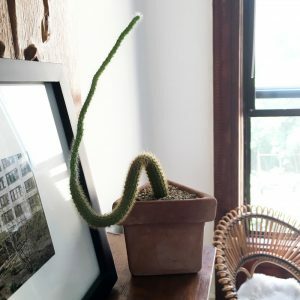 Option 1: If it has become long and leggy, take sharp, sanitary clippers, cut off the stretched part, and place the plant under better lighting. Option 2: You can also leave it. The etiolation doesn’t hurt the plant, it is just not aesthetically pleasing. Option 3: Give the plant away or otherwise remove it from your collection. A ball cactus is extremely difficult if not impossible to get into a decent shape once it has etiolated. Regardless, the plant is telling you it needs to be placed in much higher light. The above cactus and succulent have been overwatered. Overwatering happens when you’re giving too much water or watering too frequently, or if the soil you have your plants in retains water (see soil above). Warning signs are jelly-like leaves or stems, the plant is squishy-feeling instead of firm, or your plant looks like it’s melting. The best way to save your plant is to cut well above where the rot has begun. Throw away the rotten part. Allow the cut piece to heal over – dry out and form a sort of skin over the cut. Then replant the healthy portion in well draining soil. Let it sit unbothered until it begins to put on roots. This could take weeks or months. Once you have some small roots begin to give water, being careful not to over water. This cactus is corking. 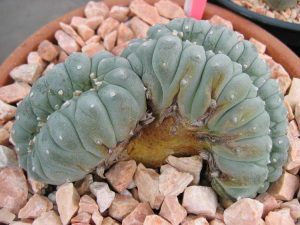 Certain species of non-cactus succulents also cork (such as some euphorbia), but it is much more common in cacti. Corking is when cacti grow heavy and large, and need to support their weight by hardening their previously soft flesh with a harder ‘shell’. This is good! It means your cactus is healthy and growing big. The above cactus is what we call crested! It’s a desirable mutation which causes the cactus to grow fused instead of in the form that it should (straight up, in balls, etc). This doesn’t hurt the cactus, although they can be more susceptible to rot because moisture can get into the tight crevasses. Crested cacti and succulents often are sold for more money because of their unique aesthetic (much like variegation). How can I propagate my plants? There are many methods of producing more plants from already existing plants in your collection. 1) Grow from seed which can be purchased or taken from your own fertilized plants. Baby cacti and succulents have a different set of cultivation requirements. 2) Grow from leaves, by plucking a leaf from the stem, allowing it to dry a few days to a week, then setting it on well draining soil. Eventually a new plant will begin to sprout from the base of the leave and root into the dirt. The leaf will dry up and you will have a tiny plant. 3) Grow a new plant by cuttings. 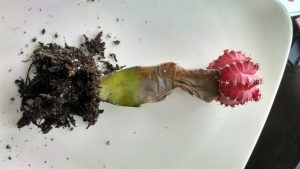 Some columnar cacti can be propagated simply by slicing off the top of the cactus, allowing it to heal over then placing it on top of well draining soil. Withhold water until you see evidence of small roots – this can take weeks to months. You can do this with other non-cactus succulents, as well. 4) Grow from pups or offsets which form on the mother plant. Gently pull or trim them off the plant and plant them in well draining soil by themselves. If they have roots already, these can be watered lightly starting about a week after potting up. Do you have any more great sources for learning about succulents? Sure do! Check out the Oklahoma chapter’s page that’s all about succulents!